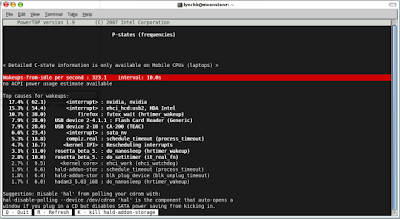 PowerTop is a nifty little command line application that takes a look at what's running on your PC and can recommend and implement changes to help you save power. Installation is quite simple. Open a terminal windows and do the following. That's it. In a terminal window type sudo powertop. Powertop need admin privileges to make changes. Dell Customer Service - Part 2 - Dell Hell. Dell Customer Service - Part 1 - Simplify IT.